So you’ve decided to be a dashing black-clad masked outlaw who defends the commoners and indigenous people of the land against tyrannical officials and other villains! So basically, if you’re looking to take up the mantle of a mysterious, dashing, dark-clad nobleman, you couldn’t do better than this guy. 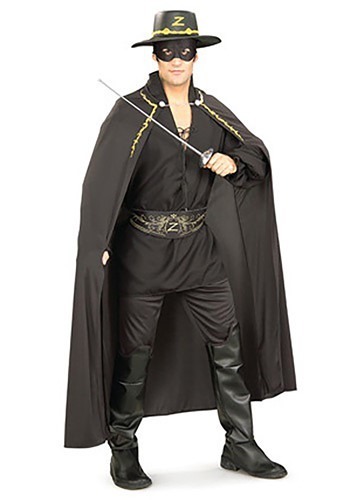 And with this Adult Zorro Accessory Kit, you'll be off to a great start! It comes with a black cape, a black half-mask (very crucial to the Zorro look), and a belt that features a signature "Z" in front. Add black leather pants, black boots,a loose black shirt, and a toy sword, and you'll be ready to slicing "Z"'s into the air (and into the hearts of adoring fans) wherever you go!